Everest Review Lite Plugin is a simple WordPress utility plugin for displaying reviews for posts, pages, and various custom post types in a quick and easy way. This plugin allows you to insert your review inside your posts or pages. You can also take a review from the site visitor and display with many other multiple customization options to change to fit the layout of the site along with responsive design. Create an unlimited review template! Everest Review Lite is very handy to make your website’s accessibility higher with more user engagement than ever before. Beautiful and sleek inbuilt template design to choose from. You can add an unlimited number of user review template/user review form template in your site. There is no limit in the number of user review template/user review form template you can use in your site. You can define each individual review to display/hide in particular pages. If the pre-available templates don’t work good for you, you can customize via setting to match your site need or the way you want. Mobile ready popup theme designs. Tested with multiple themes and WordPress versions. Not fixed on dates, but we assure you to provide you new updates and feature upgrade in the plugin on a regular basis. 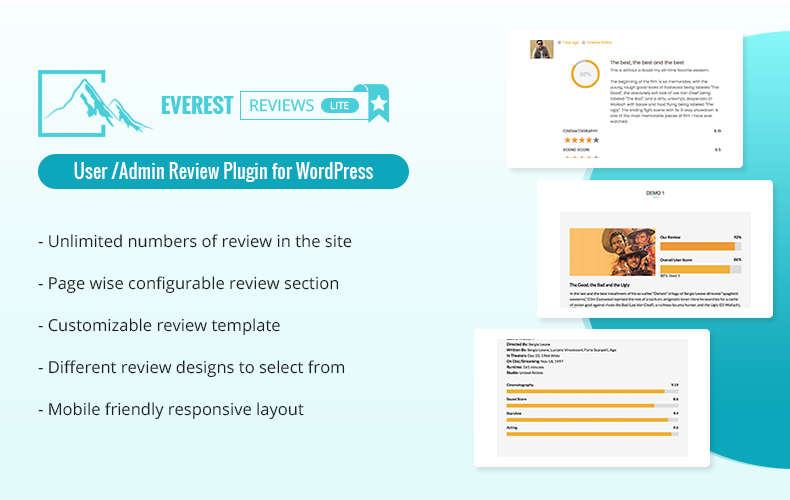 Hey Buddy!, I found this information for you: "User/Admin review plugin for WordPress – Everest Review Lite". Here is the website link: https://accesspressthemes.com/wordpress-plugins/everest-review-lite/. Thank you.